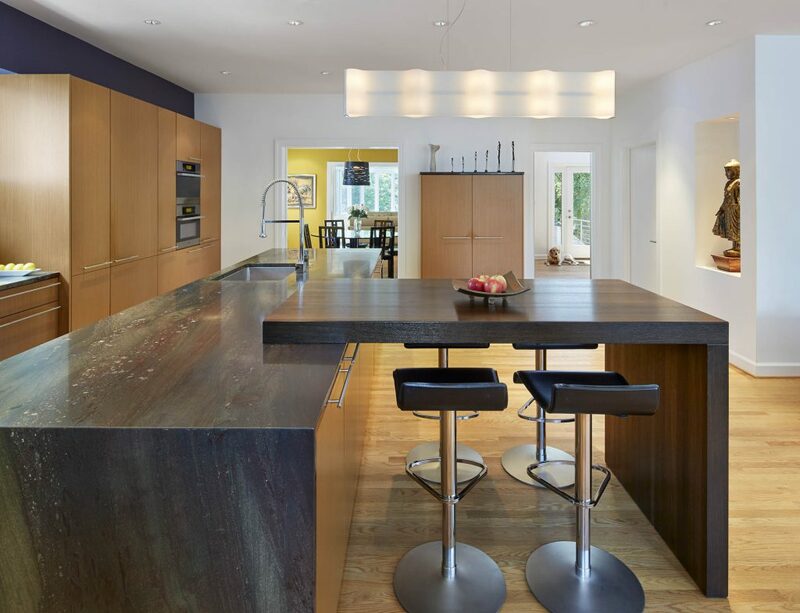 In the kitchen, quartered-teak veneer cabinetry pairs with striking stone and stainless accents. 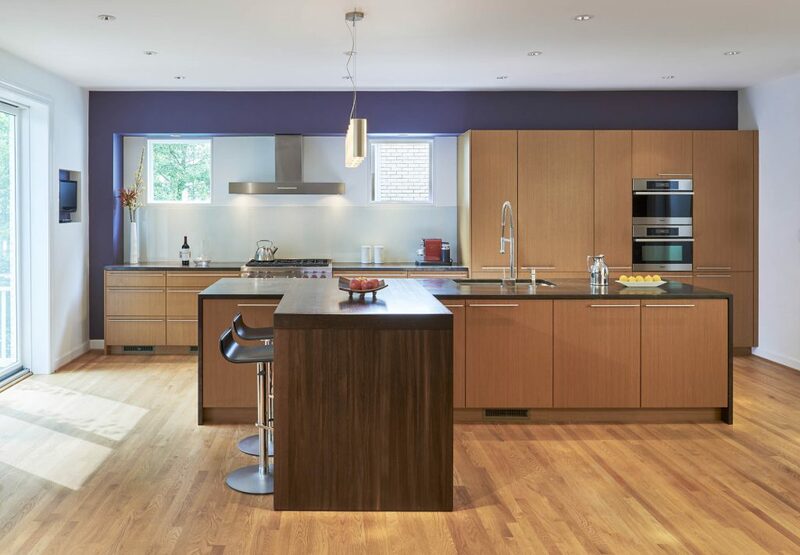 For minimalist appeal, the clients opted to forego wall cabinets for lower-level storage and an appliance wall that houses two ovens, a fridge and a pantry cupboard. 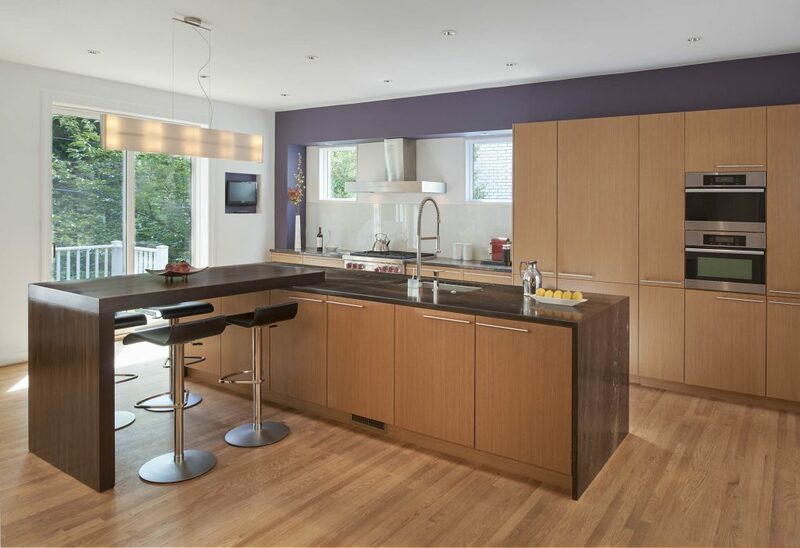 A pop of purple frames the niche into which the windows, cooktop and hood are positioned. 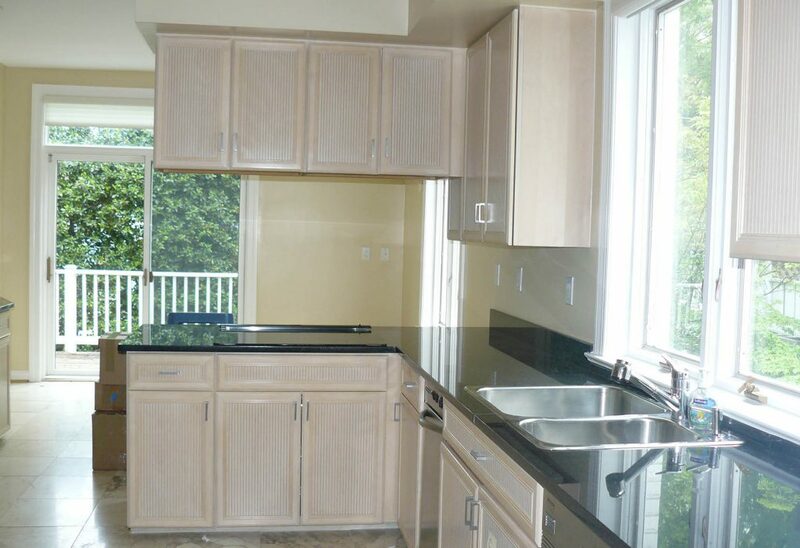 Distinctive granite counters—with swirls of green, gray, and black—add a dark counterpoint against the warm cabinetry. 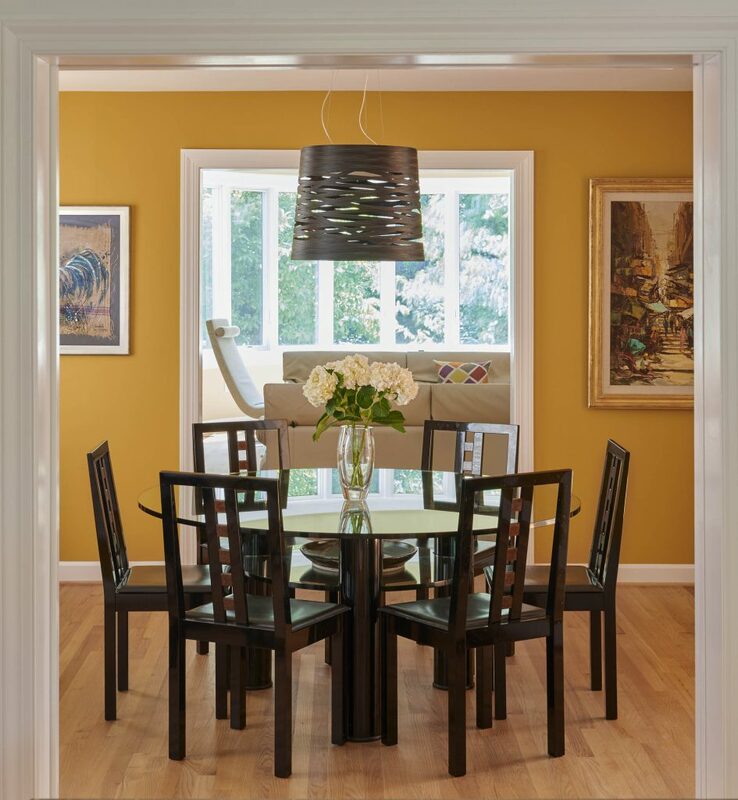 A smoked-oak bridge table, attached to the island, provides a casual dining area. Above it, a sleek pendant illuminates the room. 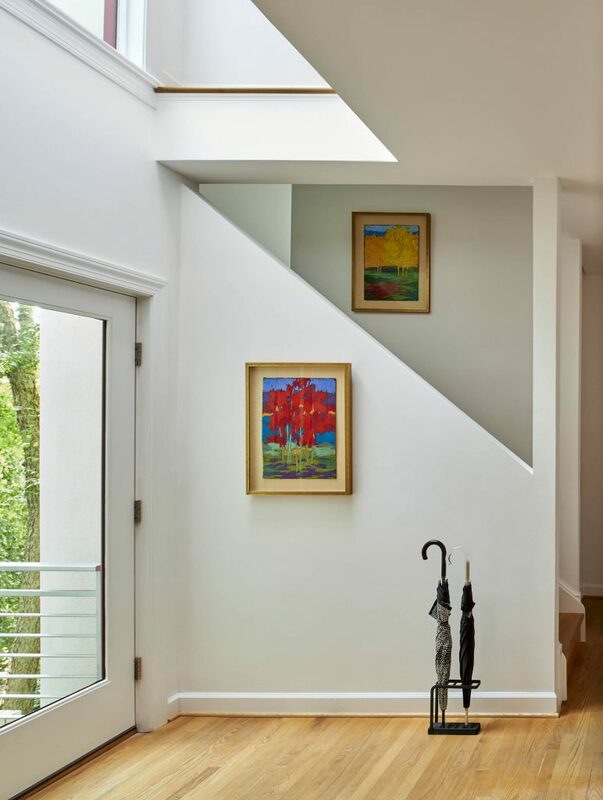 The triangular punch in the foyer creates a light-filled backdrop for art. 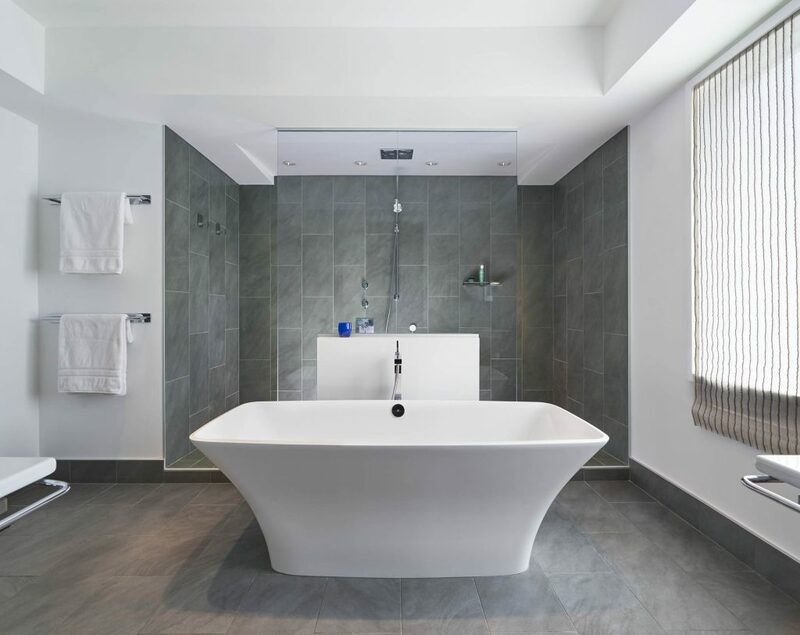 A sculptural tub makes a stunning statement in the oversized bathroom. Oversized gray linoleum tiles provide comfort and water-resistance under foot and flow seamlessly into the shower enclosure behind. The rectangular porcelain sink with vanity cabinet hangs below a simple mirror with coordinating wall sconces. 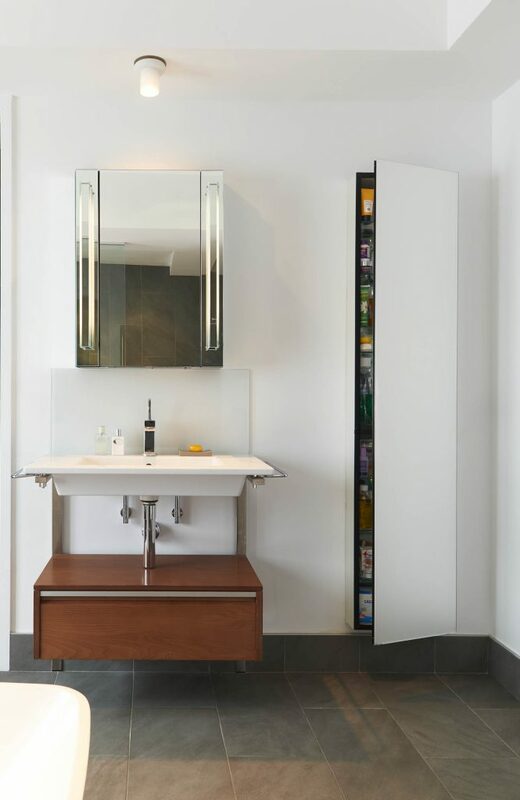 A tall, mirrored storage cabinet from Robern significantly ups the bathroom’s storage space. 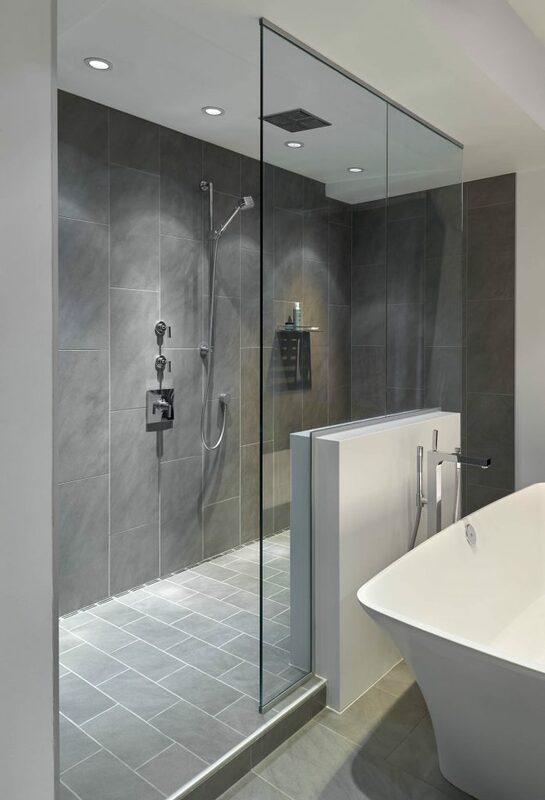 A glass curtain—with entry points at either of the end—and linear drain keep water inside the spacious shower. A partial wall visually separates the tub and shower while adding privacy to both areas. Chrome fixtures complete the polished bathroom. 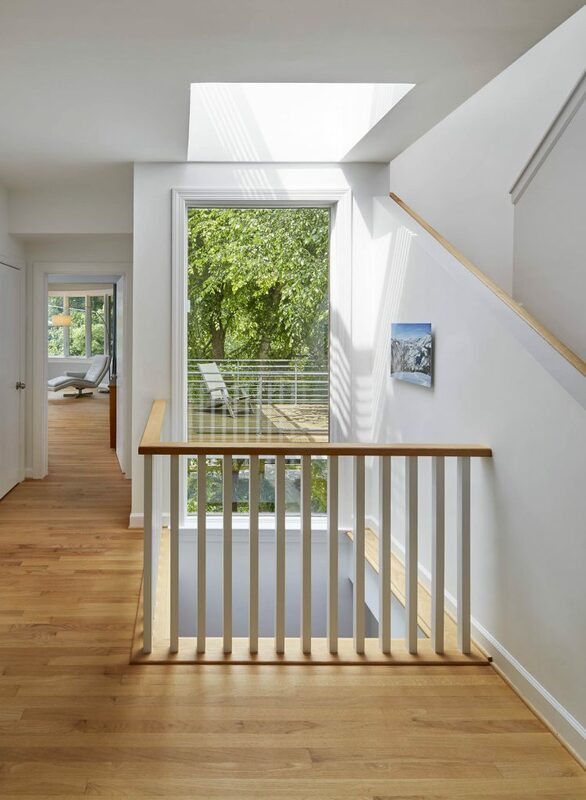 The second-floor light well now floods the stairwell with natural light from the nearby window and skylight above. 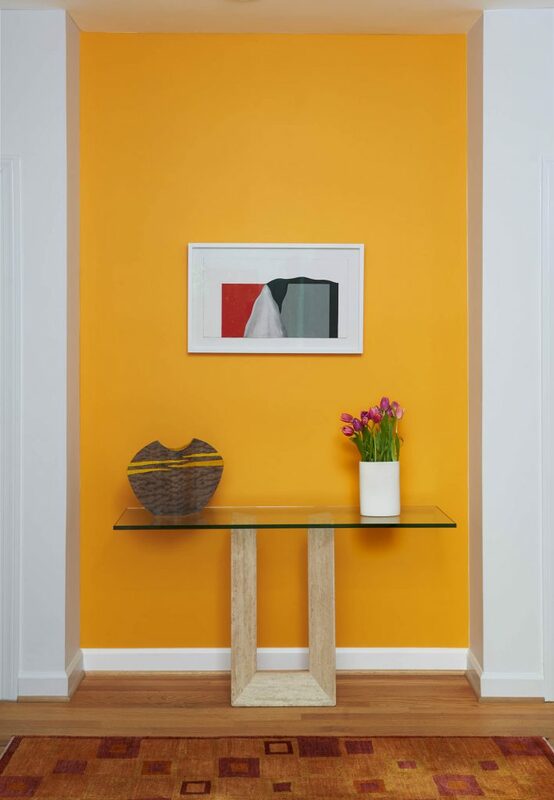 This foyer’s bright accent wall borrows the anything-but-mellow paint color from the dining room. The first floor of this 1980s home was once made up of seven separate rooms. 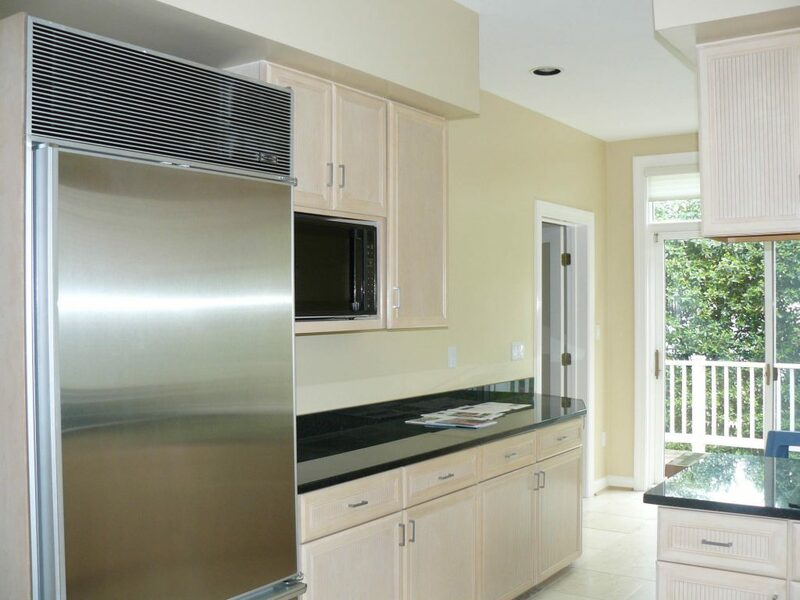 Walls came down—and flush support beams went up—to create a more open floor plan with improved circulation between the kitchen and family, dining, and living rooms. A large window behind the sink was replaced with two smaller ones, positioned high to admit light without sacrificing privacy from the neighbors. Marigold yellow walls beckon family and friends to take a seat at the table. 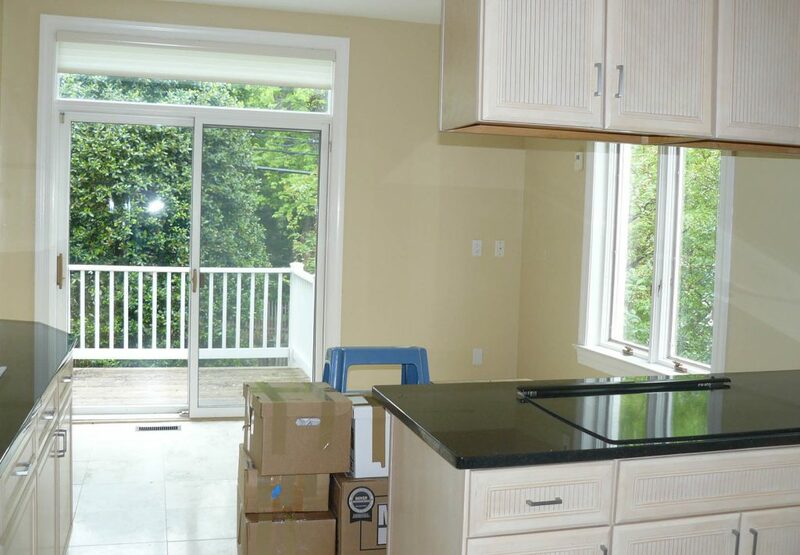 The doorway from the kitchen—now enlarged and centered on the wall—enhances flow into the dining room and living room beyond. 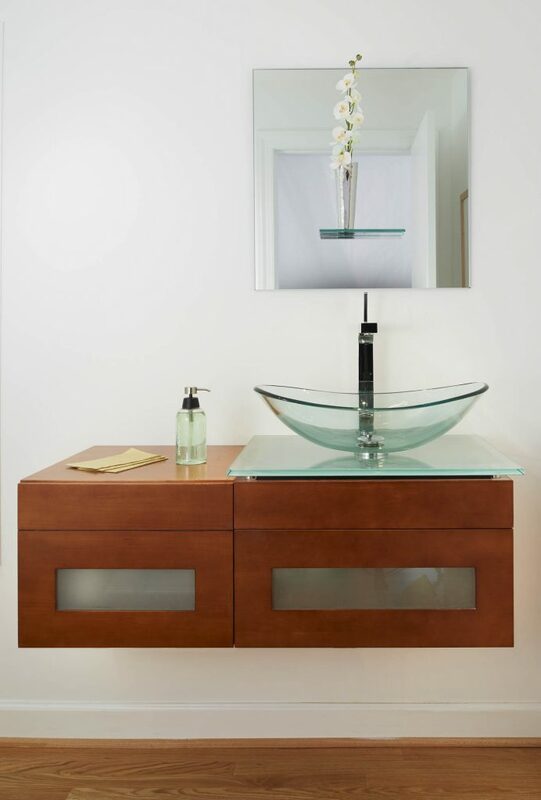 In the powder room, a clear glass vessel sink rests delicately atop the floating vanity with glass-inset drawer fronts. A simple frameless mirror—with a coordinating glass shelf—hangs above. Featured in Home & Design, Dream Kitchens, Winter 2017.